Some may recall my three-part series on The Panther (which can arise by various move orders, including 1.d4 Nf6 2.c4 Nc6 3.Nf3 d6!? 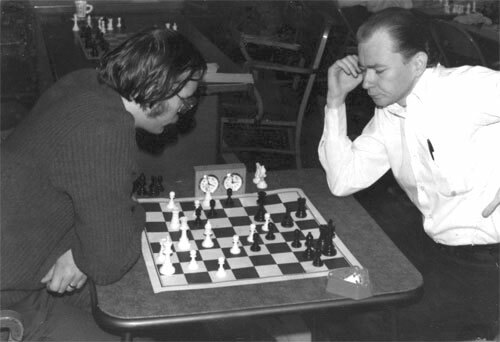 4.Nc3 e5) in which I wrote about my search for New Jersey master Bill Freeman who first developed that system with his playing partner Steve Stoyko. Well, Bill has resurfaced, exchanging some emails with me over the summer. It's a good game and worth a look. Something very similar was used recently by Nakamura against GM Benjamin in the NJ vs. Seattle match, though that game actually started with 1.g3 and turned into more of a Vienna than a Panther. Freeman had quite a bit to say about his pet line: "1.Nc3 and 2.a3 just loses a move to reverse the colors. This isn't new, Ariel Mengarini did this (e.g. 1.e4 e5 2.a3 Nf6 3.Nc3 d5 4.exd5 Nxd5 5.Qh5 the reversed Scotch Game, Mengarini - Pavey, US Champ., New York 1954) and Adolf Anderssen (e.g. 1.a3 e5 2.c4 Nf6 3.Nc3 d5 Anderssen - Morphy, Paris 1858) and others. For me it allowed the acceleration in the production of the same positions for study and research. Losing a move as White is something we're taught not to do. There are variations to be avoided where 2.a3 is definitely a weakness. So, to recommend this system without a multitude of caveats would be wrong. I think I only referred to this system as the Panther twice. I called it the Black or White Panther. But basically it's the same cat. Others might have called it by other names, some derogatory...."
I thought it was a good time to take a rest and go back to chess. It was like waking up from a coma after 20 years—not knowing at all what had taken place in theory or practice for the last 20 years or what was going on now. It's difficult to explain all the surprises. I decided to go back to square one. I think Emanuel Lasker did this at one point in his life. I study everyday using almost everything that has developed over the last 20 years. I started about a year ago, asking basic questions: What's the best first move for White? What is intrinsically and fundamentally the best reply to 1.d4, 1.Nf3, 1.c4, etc. These are the most difficult questions to answer. I'm building a repertoire for White and Black. So to answer the question: 'Do you have any interest in chess anymore?' the answer is: You bet. I think it will only be a few months now and "the Panther" will return. No doubt we will see him at the NJ Open next year. And I hope we will see him at the club before then. Maybe now we will get to see more interesting games with that intriguing line of his. Nc3, a3, g3, Bg2, d3, Bd2, Qc1 is a Snake Benoni. Can do it reversed for Black too. Note IM Day's comment. It's a very Canadian set-up; Suttles-esque. The game here was a Snake Benoni after white did g3, Bg2. Thanks for the interesting game. I think Suttles had similar games but played Nh3.